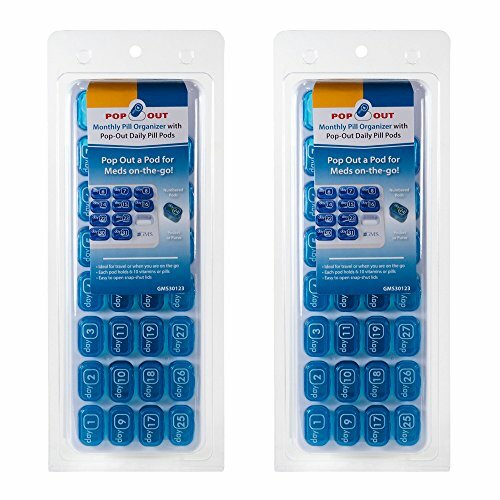 The 31 Day Monthly Pill Organizer with Pop-Out Daily Pods exclusively from GMS is great for use at home or on-the-go. The handy organizer tray is like a calendar for your medications or vitamins. To pop out pods, simply hold the tray and press up from underneath the tray. Each slot has a hole in the bottom so your fingertip can easily push the pod out. The pods are numbered to correspond with days of the month on which you need to take your medications or vitamins. Each pod holds 6 to 10 average size pills. This is a GMS Brand Product with GMS printed directly on the product. Purchase 1, 2, 5 or 12 units for the best value. GMS Brand - GMS is printed directly on the white tray.